short girl, long island. : Giveaway, Day 31: lauriebreaker. I can't believe the very last giveaway of 2012 is here! While I loved giving fun treats away to all of you, I am happy that this is over. I never realized how time-consuming this would be. Setting up the Rafflecopter, copying + pasting links, emailing people more than normal, tweeting like a beast, etc. It felt kindof spammy, but I wasn't going to go back on my word. The final giveaway comes from Laura, a reader + brand spankin' new sponsor of the blog. 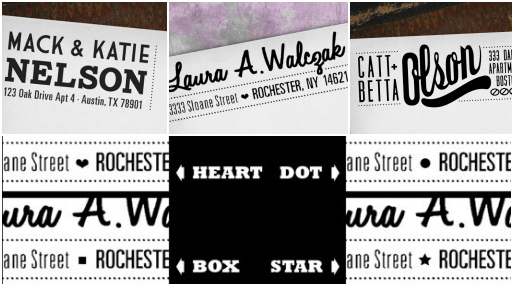 She's a graphic designer who has her own Etsy shop, stocked with fun cards + stamps, which are perfect for those of you who love snail mail [or have decided to send more in 2013]. One lucky winner will snag a rubber return address hand stamp - you can choose your design [Homestead, Nelson or Olson] - the Homestead stamp has additional options, which are shown in the lower portion of the photo below. I like the Olson self-inking return stamp! I like the Self-Inking Custom Return Address Stamp - The Olson more than is probably normal. I also love The Olson - but I want mine to be the normal rubber stamp, not the self inking one. i am partial to The Homestead and i'd prefer it to not be self inking! My favorite would be the Custom Return Address Rubber Hand Stamp! My favorite is the Self-Inking Custom Return Address Stamp - The Homestead. I'm loving the Nelson self-inking return address stamp! It reminds me of old movie theatre lettering for some reason. Love the Olson stamp. 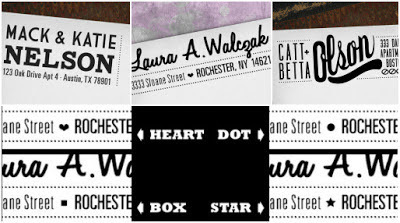 These Return Address stamps are a great idea Laura! P.S. Loved your Christmas card! I like the Nelson stamp!